THANKS TO EVERYONE WHO CAME BY AND SUPPORTED THE MERCHANTS OF MELLOR ON FEB. 10! Each business will have its own special deals going on. CHECK OUT ALL THE DEALS BELOW! Has the tuba player in your life ever wanted to read comics? 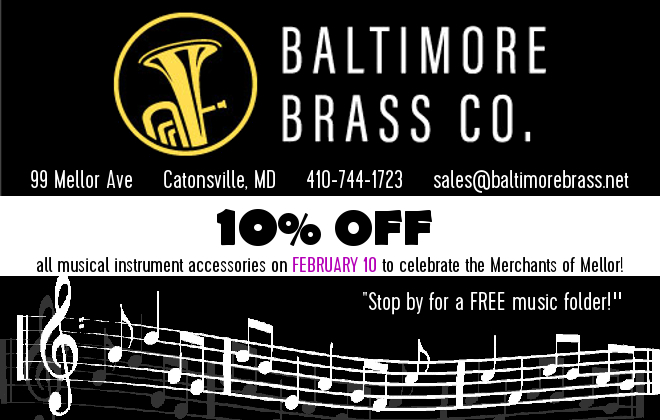 March them from Baltimore Brass on down to Cosmic Comix! Does the Crossfit fanatic in your family have an appreciation for vintage furniture? Have them roll that giant tire over to Home Anthology! Knitting and Needlepointing? Fun for the whole family! Then when you stomach starts growling, get yourself a slice from Peace-A-Pizza! We are the Merchants of Mellor and we can’t wait to see you on Saturday, February 10!